I'm going to go ahead and declare pizza as my favorite food... or at least my favorite food of 2011. To me, it's the ultimate comfort food. A pizza can be traditional or it can be a surprisingly good creative variety, like this one. E and I love to grill, so I can't believe it took us until this year to try grilled pizza. As much as I loved using my pizza stone in the oven all winter, I can't believe the difference a hot grill makes. Our pizza crust is perfectly crisp and bubbly on the outside and chewy on the inside. Think Bertucci's or California Pizza Kitchen, except you get to make it at home and top it any way you like! 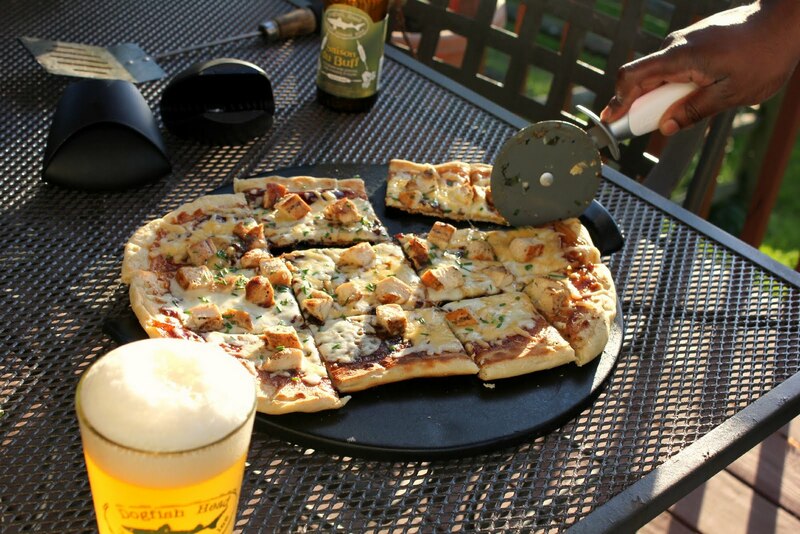 I love my Emile Henry pizza stone, but I'm sure any stone will work (or even a grill-safe pan). We love the smoky flavor of grilling on charcoal, but you can do this on a gas grill, too. If you're new to charcoal, check out my tutorial on how to build a fire. If you think the combination of barbecue sauce and cheese is weird, please trust me... it works! The crust and the sauce almost become one and the smokiness from the grill, the smoked gouda, and the grilled chicken really take this pizza over the top. Plus, there's the subtle onion flavor from the fresh chives at the end. I'm getting hungry just writing about this. This is definitely a good pizza. Try this after a long day at work (it's cooked in less than 10 minutes, minus the time spent to build the fire) or when you are entertaining friends. Why not have a grilled pizza party? I should do that sometime! Place a pizza stone over medium/high heat and preheat for 15 minutes. While the stone is heating, coat a pizza peel (or the backside of a baking sheet) with flour or cornmeal. Place the dough on the pizza peel and stretch it to a thin circle, about 14" in diameter. Carefully slide dough from the pizza peel onto the preheated pizza stone. The flour (or cornmeal) should make this transfer easy. Cook the dough for 2-3 minutes, using a spatula to check the bottom side for doneness at regular intervals. Once the bottom side is lightly browned and the top has big air bubbles, flip the dough. Working quickly, top the pizza with barbecue sauce, cheese, and chicken. Cover the grill and cook for an additional 2-3 minutes, or until the underside is golden brown and the cheese is melted. 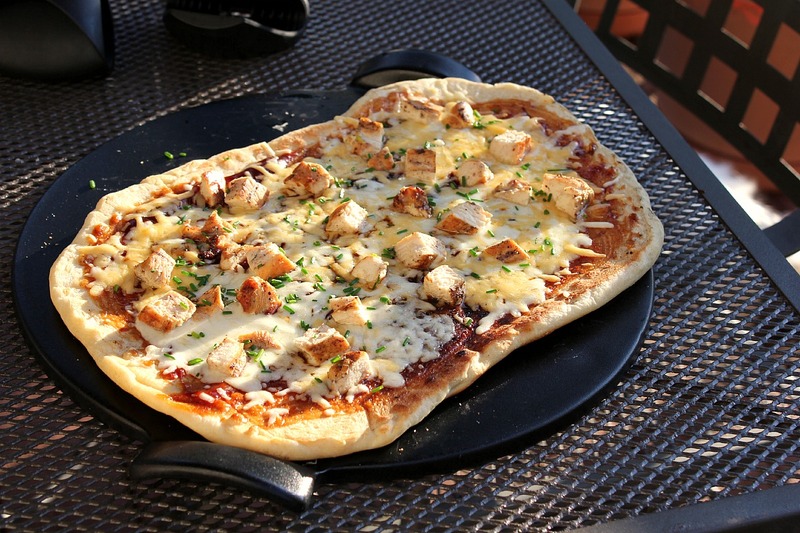 Remove pizza from the pizza stone and place on a cooling rack. Top with chives. Slice and serve. YUM - this looks absolutely amazing! Really want to give this a try this summer.